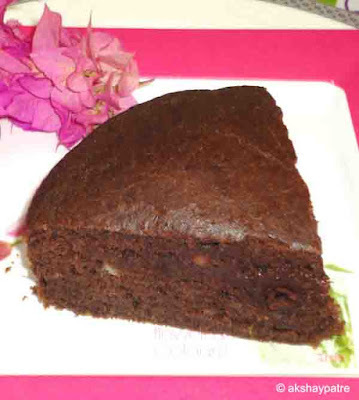 Eggless chocolate banana sponge cake recipe - Happy New Year to you all. May this New Year bring happiness and prosperity to all of you. Today being new year day, I made this eggless chocolate banana sponge cake for us. It is an easy to prepare delicious cake to be enjoyed during this special occasion. As the name suggests, the cake was spongy, moist and soft. Baking cake is an easy and enjoyable task. The fragrance spread in the kitchen after baking this cake makes you happy and craving for more. Peel and put the bananas in a large bowl. Mash well with a spoon. Add the butter and beat well till the butter mix with the banana. Sieve together the refined flour, sugar powder, cocoa powder, baking soda and baking powder. Add this flour mixture to the banana, butter and milk mixture. Fold and cut the batter. Grease the cake mould with butter and dust with refined flour. Pat and remove the excess flour. Stir the batter well and pour into the mould. Tap the mould slightly to spread the mixture evenly. Bake in the preheated oven at 180 degree celsius for 20 minutes. If a knife inserted in the cake comes out clean, the cake is ready. Demould in a plate and allow it to cool. Cut into pieces and serve. 1. Preheat the oven at 180 degree celsius for 10 minutes. Peel and put the bananas in a large bowl. Mash well with a spoon. 2. Add the butter and beat well till the butter mix with the banana. 3. Add the milk and mix. Sieve together the refined flour, sugar powder, cocoa powder, baking soda and baking powder. 4. Add this flour mixture to the banana, butter and milk mixture. Fold and cut the batter. 5. Grease the cake mould with butter and dust with refined flour. Pat and remove the excess flour. Stir the batter well and pour into the mould. Tap the mould slightly to spread the mixture evenly. 6. Bake in the preheated oven at 180 degree celsius for 20 minutes. If a knife inserted in the cake comes out clean, the cake is ready. Rest in the oven for 5 minutes. 7. Demould in a plate and allow it to cool. 8. Cut the eggless chocolate banana sponge cake into pieces and serve. lovely Excellent delicious yummy chocolate banana sponge cake .. Wow!!!! amazing cake, i can only imagine the taste. love the combo. I will try it soon.